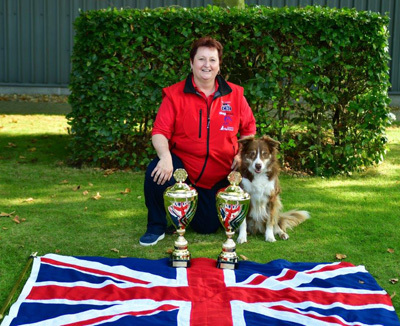 The team at Puppy School were proud to sponsor the British team as they competed in the Open European Heelwork to Music and Freestyle Championships which took place in Belgium in August 2017. Kim Lyddon was a member of the squad, along with Border Collie Tyler (Canen You Said What) who attended Puppy School classes in Warrington, Cheshire. We are over the moon to share the fantastic news that Team GB won both the Heelwork to Music and Freestyle competitions, the first time that Great Britain has ever won, or even been placed in Freestyle. Kim and Tyler were thrilled to be placed in the top 10, making a valuable contribution towards the team’s gold medal. Kim competes at the top level of canine freestyle in the UK. The duo has reached the Crufts Freestyle finals four years in a row. Kim and Tyler have secured a place in the 2019 Crufts HTM Freestyle Semi Finals. Another member of Kim’s canine family is Archie, a Pyrenean sheepdog who is also a Puppy School Graduate. Archie qualified for advanced competition and now eligible to enter Crufts qualifier classes. Archie and Kim appear at both Crufts and Discover Dogs, as part of Richard Curtis's demo team. Rio, a red-and-white border collie, is the youngest member of Kim’s canine family; he is just starting his journey in freestyle. We are delighted that Puppy School was able to provide Tyler and Archie with a fantastic start to their exciting careers. Photo credit to Allan Brown. Kim is a qualified UK Kennel Club Heelwork to Music/Canine Freestyle judge. She is delighted and proud to be a Karen Pryor Academy Certified Training Partner (KPA CTP), IABTC Approved Instructor (Distinction) and Animal Behaviour & Training Council (ABTC) Registered Animal Training Instructor.